Renault is still in "big" financial trouble and David Richards has expressed interest in buying into the Enstone based team. That is the claim of the Dutch newspaper De Telegraaf, adding that one of the richest Dutch entrepreneurs Marcel Boekhoorn has been asked to support Prodrive chief Richards' interest. "I've heard about it but I do not know what to think of it," said Jan Paul ten Hoopen, who is Dutch GP2 driver Giedo van der Garde's manager. The link with van der Garde is that the 26-year-old driver is married to Boekhoorn's daughter. Ten Hoopen continued: "I think it is pretty much a mess within that team (Renault). 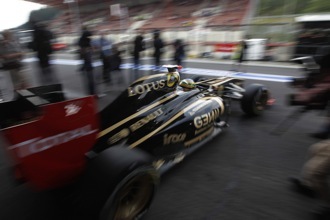 Put it this way, it is clear in terms of Lotus-Renault that many things remain unclear. "Certainly if there is any more to it, we should see if there are any opportunities for Giedo," ten Hoopen is quoted by NUsport. Richards, also the former BAR boss, was the team principal at Enstone based Renault when the team was known as Benetton in the late 90s.